As both Golden Retrievers and Poodles are two of America’s most popular breeds, it’s not surprising that Golden doodles have won many hearts. These adorable dogs have many endearing qualities, including intelligence and a desire to please. They are normally happy dogs and love being with people. Goldendoodles date from around the mid 1990s in the United States. They are something of an update on the old Cockapoo crossbreed (Cocker Spaniels and Poodles) that was popular in the U.S. for so long, but they are generally much larger. Golden doodles are usually around 40-60 pounds for females and 60-70 pounds for a male (Golden Retriever-Standard Poodle cross). Miniature Poodle-Golden Retriever crosses are smaller. Coat colors for Goldendoodles can usually be almost any color found in Poodles: white, caramel, ginger, blond, tan, cafe, chocolate, red, black, silver, parti-colored, phantom colored, or a mix. Different colors can be found in the same litter. The coat of a Golden-doodle is often what makes the dogs appealing to many people. Golden Retrievers typically shed a lot, but Poodles are known to shed very little. By crossing the two breeds it’s hoped to produce puppies that will have coats more like their Poodle parent. Most puppies don’t have the tight curls of their Poodle parent, but they often shed much less than a Golden Retriever -- although it would be going to far to call them totally hypoallergenic. They can make good dogs for allergy-sufferers, however, but it depends on the individual dog. Golden-doodles can have either curly, wiry or wavy coats. 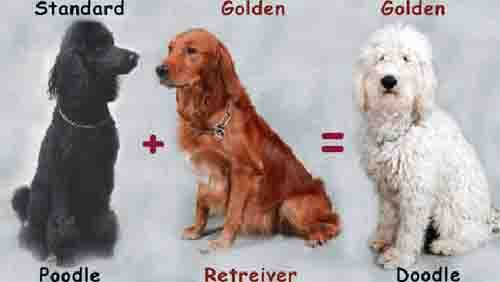 As with other hybrid dogs, Golden doodles are often healthy in the first generation cross (Golden Retriever x Poodle). This is called “hybrid vigor” and it is what designer dog breeders aim for in breeding dissimilar purebred parents. The idea is that the possible genetic problems in each purebred parent will not find a match in the other parent and so not be expressed in the resulting puppies. However, some possible health problems may be carried by any dog, regardless of breed, and so will show up in offspring. For instance, if the parents both have bad hips then the puppies will probably also be affected by bad hips, regardless of the fact that the parents are different breeds. That’s why it’s so important for breeders to do health testing on the parents prior to breeding to make sure they are healthy for breeding. Golden doodles, like Labradoodles, are at risk of hip problems and their parents should have their hips x-rayed for hip dysplasia. They are also at risk of Progressive retinal atrophy (PRA), a disease found in Poodles, and their parents should have their eyes tested. You should ask your breeder about these tests when you discuss puppies with them. If you are interested in a Goldendoodle make sure that you like both Golden Retrievers and Poodles. Your puppy will carry characteristics of both breeds, not only in appearance but also in temperament. Golden doodles have been a very successful hybrid cross over the years and they frequently make wonderful family dogs but you should remember that every designer dog is different. They do not have quite the predictability of purebred dogs so you should talk to your breeder and make sure that this is the right dog for you. Try to visit your breeder is possible and meet both puppies and adult Golden-doodles so you can see how your dog will develop. PLEASE be sure this is the right type of dog for you. 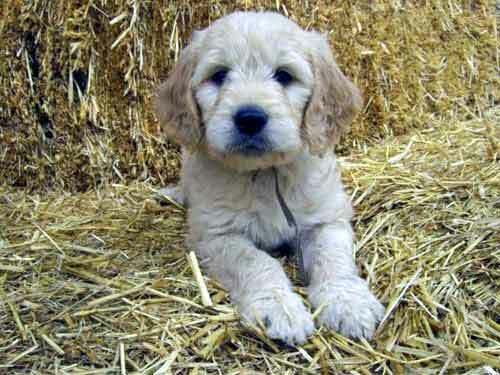 - Click here to know even more about the Goldendoodle Dog Breed. Do you know more about this Dog Breed? Share it! Would you like to add or change something? Do it! Please send pictures or more valuable information about this Dog Breed...it will be much appreciated!! !